May 25, 2018, 10:56 a.m.
We’re seeing what publishers have decided to implement on their websites as of May 25 — whether they’ve decided to block European Union and European Economic Area-based traffic outright, set up buckets of consent for readers to click through, or done something simpler (or nothing new at all). By Shan Wang and Christine Schmidt May 25, 2018, 10:56 a.m. The GDPR includes the ‘Right to Be Forgotten,’ which allows individuals to request that search engines and other platforms remove specific information about them. Effectively, this would allow an E.U. citizen to request that Google remove stories and websites from search, and it could have a profound effect on the dissemination of newsworthy information. While there are some exemptions in place to protect news outlets, journalists and researchers, it’s possible that investigative projects like this year’s Pulitzer Prize-winning #MeToo series, which relied on a tremendous amount of personal data, may not be seen, at least not easily, in some democratic countries that uphold the tenets of free speech. The subjects of those stories might object to the reporting and demand that their names and likenesses be removed. These splinternets are already happening. 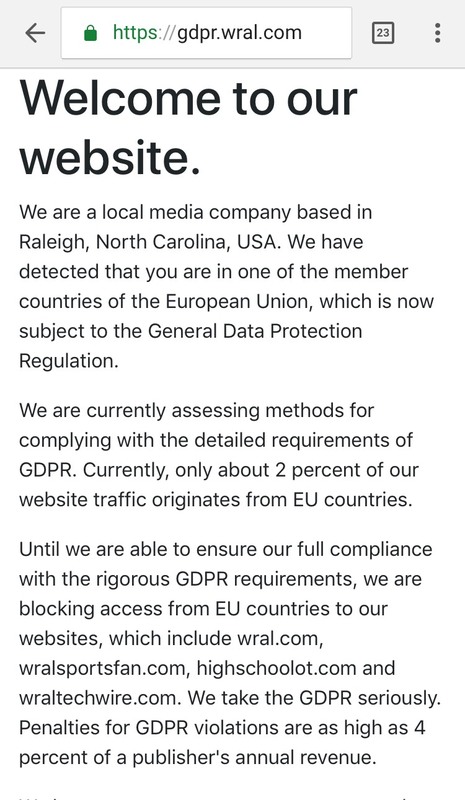 Local news outlets, like North Carolina TV station WRAL (screenshot courtesy of Robert Socha) and all Tronc properties have blocked access to visitors from the European Union. 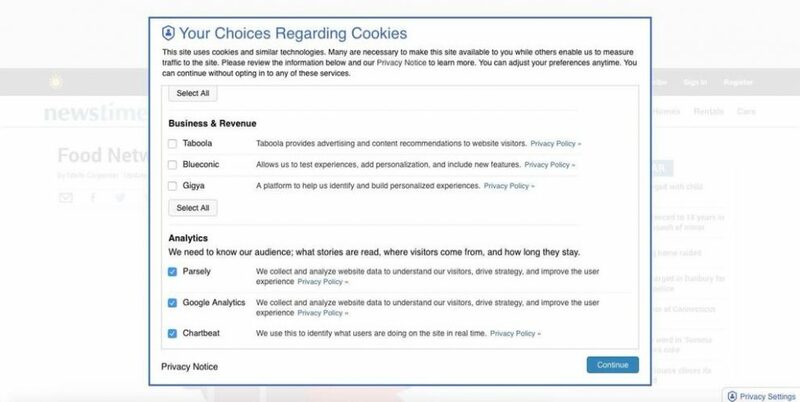 Connecticut’s NewsTimes asked visitors to choose which services their information is shared with, from Taboola to Chartbeat — but apparently their GDPR explanation was inaccessible to EU browsers. Access isn’t shut off everywhere, though: NPR is asking visitors from the EU to agree to their terms or view the site in plain text only. The Atlantic’s comprehensive ask walks users through the different options of data processing. Other services, like reading app Instapaper, movie and TV review app Stardust, and inbox-declutterer Unroll.me, have shut down access to EU customers and sometimes even erased their accounts. The countdown-to-GDPR clock is now reset to the countdown-to-first-penalties clock (activists have already filed complaints against Google and Facebook). POSTED May 25, 2018, 10:56 a.m.
Schmidt, Shan Wang and Christine. "Welcome to GDPR: Here are the data privacy notices publishers are showing their Europe-based readers." Nieman Journalism Lab. Nieman Foundation for Journalism at Harvard, 25 May. 2018. Web. 20 Apr. 2019. Schmidt, Shan Wang and Christine. "Welcome to GDPR: Here are the data privacy notices publishers are showing their Europe-based readers." Nieman Journalism Lab. Last modified May 25, 2018. 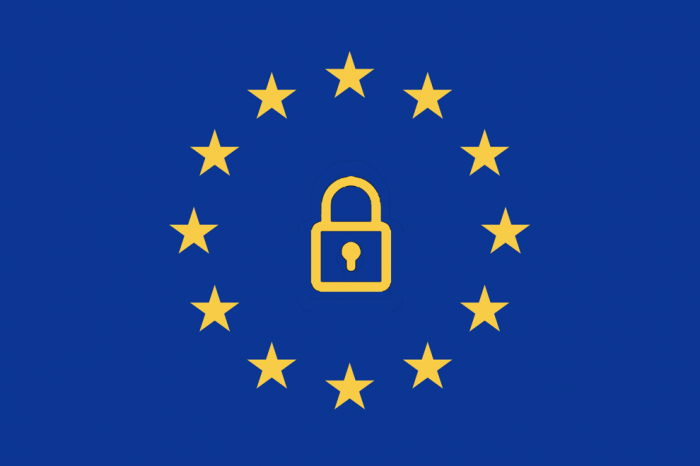 Accessed April 20, 2019. https://www.niemanlab.org/2018/05/welcome-to-gdpr-here-are-the-data-privacy-notices-publishers-are-showing-their-europe-based-readers/.